Filled with fresh coffee beans, mounds of homemade cream cheese and a wide variety of bagels, Java Depot is downtown's newest independently owned coffee shop. The shop is owned by Mark Whitehead of Whitehead Oil Company, but was conceptualized by Bob Von Kaenel, Java Depot's supervisor. For 13 years, Von Kaenel previously owned Big Apple Bagels on O street. He said he'd retained his passion for bagels and coffee, and told Whitehead he'd love to run another shop one day. As Whitehead and Von Kaenel looked around for the perfect location for their new Which Wich store, they realized the space they wanted could be split in two, one side for the sandwich shop and the other for Von Kaenel's creation. Soon after, Java Depot was born. In addition to the coffee, a selection of sweet and savory bagels as well as muffins are on display at the store. 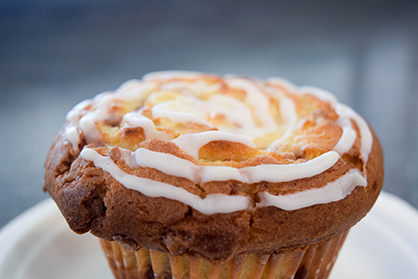 Muffins at Java Depot are homemade and baked each morning. Von Kaenel uses the same baker he worked with at Big Apple Bagels. Java Depot also sells seven different types of cream cheese, each made in the store each day.
" I have a cheddar bacon cream cheese that goes really well on the savory bagels," he said. "We have a veggie cream cheese and we're actually chopping veggies each morning to put in there." He said aside from seasonal drink specials, he doesn't see much rotation in terms of flavors for the shop. After 13 years of running Big Apple Bagels, Von Kaenel said he knows what customers want. "Our real specialty is our coffee," he said. "We get our beans from a few local roasters. I've been a coffee geek for about 20 years. After owning a coffee and bagel shop, I started getting really into it. I went to coffee shows and then I got certified to be a barista trainer in Chicago. Then I got certified to be a barista judge in competitions. I'm deeply into the coffee culture. We get our beans in fresh every week. They're very well done and all fair-trade and organic. I was lucky enough to get my boss to go along and get the very best equipment to get the very best drink." 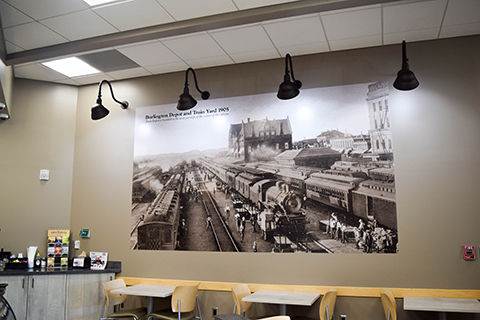 In addition to serving up quality coffee and food, Java Depot puts the history of their location on display with a large photograph mural, the photo dating from 1908. "This is the old depot," he said, referring to the photo. "That one was torn down in the '20s. Middle left of the mural is Java Depot location. We had help from Nebraska Printing. When we were designing this place, I called Ed Zimmer, local historian, and he told me to swing up to his office. I figured we would frame some old photos and put them around the wall. When I went in there, he showed me some old photos and was projecting them on the wall. A light bulb went off and I got in touch with Nebraska Printing and there you go. They had to do quite a bit of cleaning up on the photo because this literally was a postcard. They did a nice job." 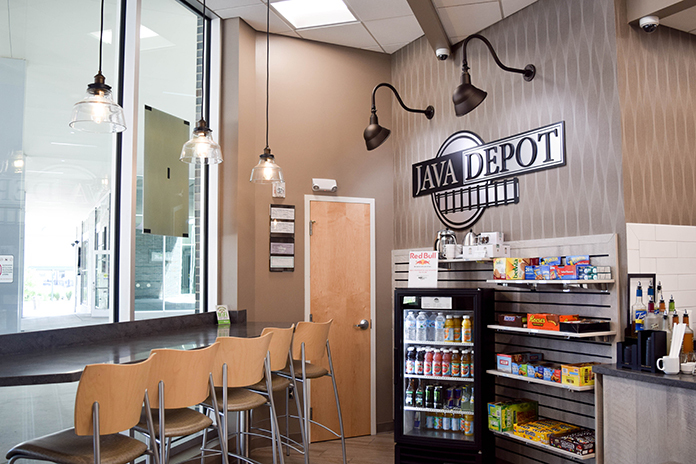 As summer months continue, Java Depot will continue offering cold beverages and monthly deals. In July, the store offered an ice cream blended coffee drink for 99 cents. Von Kaenel said he plans on creating seasonal drinks for the fall and winter and taking customer's input to continue creating crowd favorites.